We didn’t have much planned this weekend, so I did two Magic drafts. 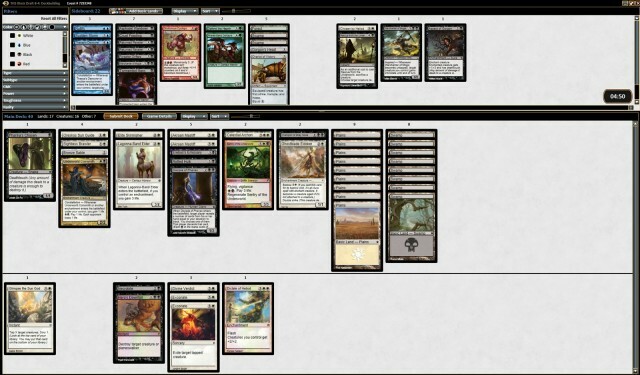 Saturday’s draft was a Black/Red deck where I first picked King Macar, The Gold-Cursed – and then lost my connection to Magic Online, and lost my next 3 picks. I ended up with a weak deck and got blown out in the first round. While some of it was poor drafting, there were some signals late in the first pack which make me wonder if I would have taken another approach had I been able to see those three picks. I like the fact that you can build your sideboard as you draft. The cards look a little better, too, and I do like a white background better than a black background – it feels more welcoming and friendly, I think. I would pick Revel of the Fallen God here if not for the fact that Dictate of Heliod is one of the best cards in the set, so this was a no-brainer. Plus I enjoy playing white and have had some good luck with it. So Dictate it is! I think playing Revel would be fun, and I would totally spend one draft trying to force Red/Green in order to play it. My philosophy on second picks is to stick with the best card unless the best card in the same color as your first pick is only marginally worse than the best card. I think Pharika’s Chosen is somewhat better than Eagle of the Watch, and most of the rest of this pack is pretty bad. Flurry of Horns is pretty good, but I’d rather go White/Black than White/Red. And White/Black tends to be a controlling strategy where Pharika’s Chosen works well. Akroan Mastiff is a good card for a control deck. None of the other cards here are much good. Also: Dictate of Kruphix appeared in consecutive packs. A 3/2 for 1W is good even with his drawback. Dreadbringer Lampads is okay, but not great. 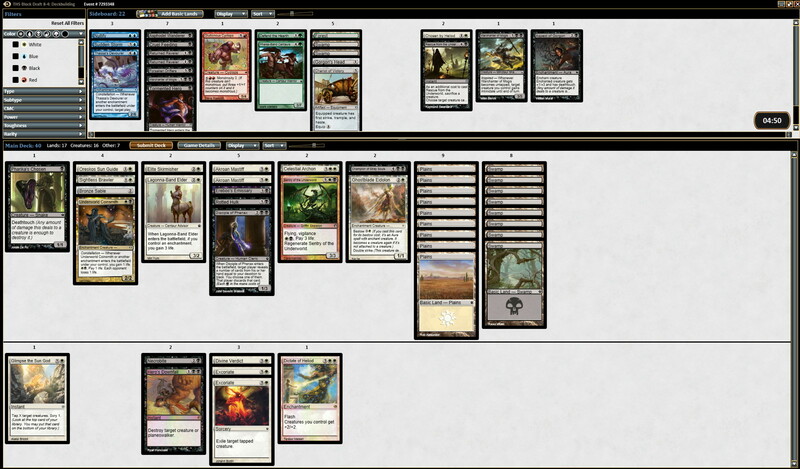 Nyx Infusion is also okay, but White/Black has better removal later. Exactly what my deck wants. If the Coinsmith weren’t here, I guess I’d take Harvestguard Alseids. A weird pack for me. Oppressive Rays works better in an aggressive deck than a control deck, and I doubt Squelching Leeches will be much good for me since I’m probably going more White than Black. Nothing here I’m going to play, so I’ll take away someone’s fatty. I’m pretty impressed with Rotted Hulk in control decks and I’m happy to have it. Notice that Revel of the Fallen God wheeled – I’m glad I didn’t try to force to play it, because I didn’t see many good Red or Green cards go past me. Heh, both Dictates of Kruphix wheeled. It is not a good limited card. Three cards in my color, but I’m unlikely to play any of them. This was a tough pick: Glimpse the Sun God and Excoriate are both good cards, and I couldn’t decide which I wanted. Finally I decided to rely on people saying Glimpse is quite good (I’ve never played with it before), and Excoriate is a common so there may be more of them, plus there are similar cards available to me in the next 2 packs. Hey look, an Excoriate! Nice to feel instantly justified in my previous pick. This is a weak pack. I could have taken Revoke Existence, but I’d rather have the creature if I need it. 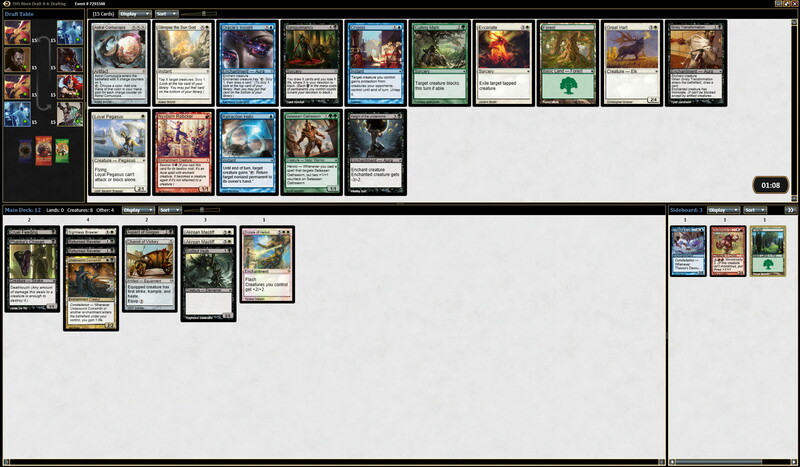 Especially since Saturday’s draft left me with a creature-light pool. I don’t want to make that mistake again. Hard to resist the Mythic Rare here. A second Glimpse might have been just as good. Mortal’s Ardor is also decent. I need some cheap creatures. Probably should have taken the Fellhide Brawler here, though. Ghostblade Eidolon is a great card if you can bestow it, but not so great otherwise. A second Ghostblade Eidolon. As it turns out I probably should have taken the Nyxborn Shieldmate with my previous pick – and probably have still taken the Sun Guide here. And what do you know, the Excoriate from my first pack wheeled. People really don’t seem to like it. It would be better if it were an Instant, but I still think it’s pretty good. Hard to believe the Sudden Storm wheeled here. I understand taking Nyxborn Triton over it, but Meletis Astronomer and Deepwater Hypnotist? Aspect of Hydra still being here is also a bit weird. Anyway, nothing here I want, so I’ll take the Storm. So what I really want in pack three are Gray Merchants of Asphodel and Scholars of Athreos. Swing and a miss. Erebos’s Emissary is a decent card, but not exactly what I want. Celestial Archon, on the other hand, is an outstanding card and I’m very happy to get it. And a premium removal spell finds its way to me. Suddenly I’m feeling pretty good about this draft! Disciple is not exactly what I want, but it’s okay. Disappointing. Chosen by Heliod might have been a better choice, but neither excites. Another good removal spell – better than Excoriate in most cases because it’s an Instant. I looked at this pack disappointedly for a moment before I saw the Sentry, which is exactly what I want! No Gray Merchants and no Scholars. Sadface. I went heavier on White than on black because my cheap cards tend to be White, and I have more double White symbols. 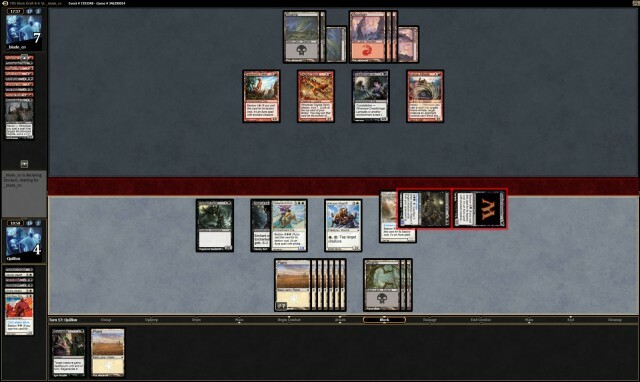 I was a bit hosed in not having drawn a second Swamp, but having all three of my cards which required 2 Black to cast. Finally I got him down to 4, tapped some of his stuff, bluffed that I had a creature card to discard to the Emissary, and he conceded rather than play it out. Against his fast deck I thought I could absorb some blows, perhaps draw an early blocker since I was on the draw, and almost certainly draw a land for my Excoriates by turn 4. Unfortunately I didn’t draw a small creature, did kill some of his stuff, but he got me down to 2 life too quickly. Even though I had a couple of big blockers and Dictate of Heliod in play, he played too many 2-power weenies for me to handle. 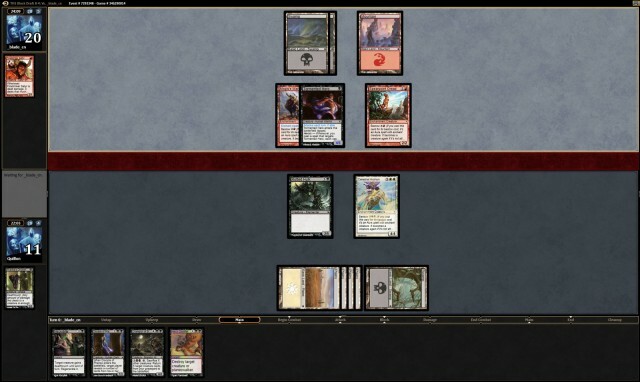 I kept it and I shouldn’t have: I had no Swamp, no play before turn 3, and effectively no removal. He got off to another fast start, got King Macar down, and I didn’t have a way to deal with it. I never draw my removal this time, and got run over. I’ve made this mistake before, having a hand with “potential” which I kept, and it never came in. 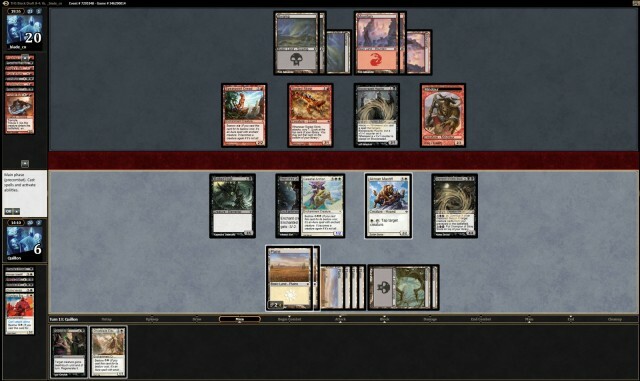 Here I think there are just too many weaknesses in my hand: If I had another early drop, or a Swamp to play Pharika’s Chosen on turn 1, then it would have been a reasonable keep. But I should have mulliganed this. The other problem is that the first game went on so long that I only had 4 minutes of time to play this one, and in fact I timed out before he could actually kill me. So I was probably doomed either way. Disappointingly, I never drew either the Underworld Coinsmith or the Sentry of the Underworld. Other than playing faster and mulliganing that last hand, I was reasonably happy with my play. I probably could have thought through some choices in the first game a little better. But I think fundamentally I lost this match during the draft: I needed to prioritize cheaper creatures a little more: Possibly I should have played the Returned Revelers over something expensive like the Champion of Stray Souls. And surely have taken the Nyxborn Shieldmate over the Ghostblade Eidolon. 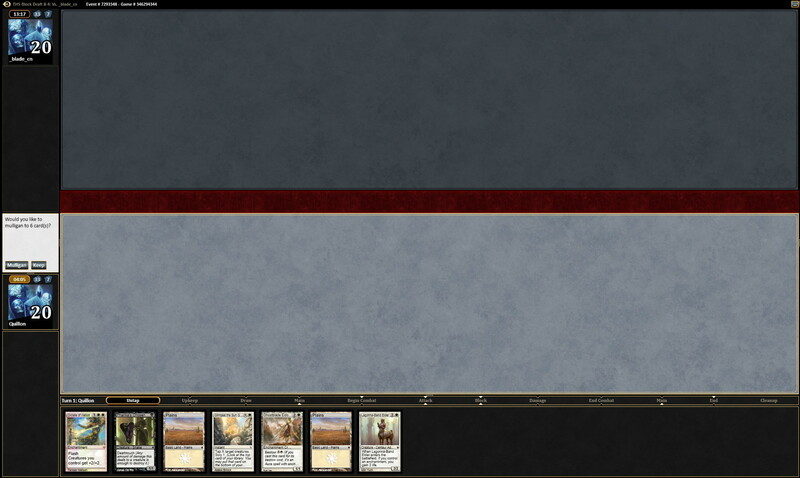 Anyway, I clearly have a ways to go to be a good limited Magic player. By the next time I draft, Magic 2015 will be out, so I might try that. I think I usually do better at triple-set drafts rather than full-block drafts. We’ll see. 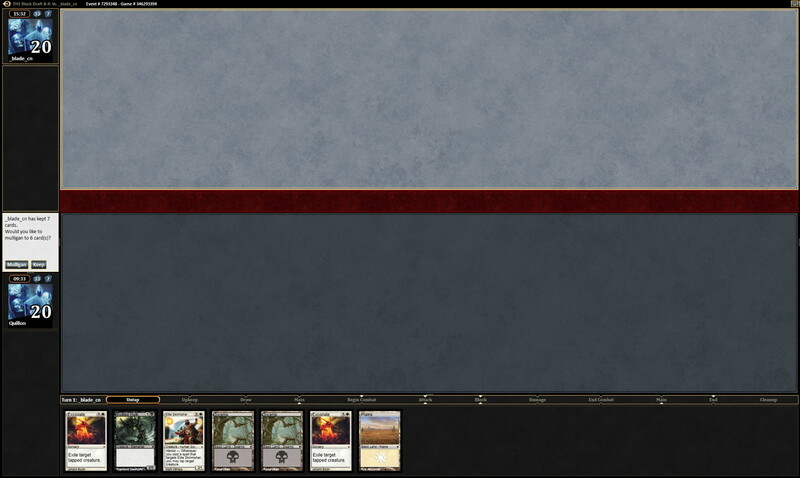 I dislike playing controlling decks in Limited unless I have exactly the right stack. Otherwise I feel like the deck with 16 creatures is going to run through the removal/blockers I draw and grind me out. In order to make it work you have to have the bomb to build towards and either a good creature curve or a ton of tempo/bounce cards to let you stabilize. I think that one deck I played against you with Ashiok, Nightmare Weaver as the end trump worked well because the same cards that defended me defended him, and there’s very little else that can remove him without a lot of burn. P2p5 I would have tried Acolyte’s Reward instead of the Sun Guide – I think his inspired ability is not useful in a controlling deck which won’t often attack with him, while the Reward can be a blowout in a stalled board. Well, “controlling decks” in limited have a different meaning from in constructed – you still need to run a reasonable number of creatures, but those creatures are intended to stall out the board state (this is especially true since removal at common has been seriously nerfed in recent blocks). So walls and Deathtouch creatures and guys like Scholar of Athreos are all components of control decks, in addition to removal and bounce spells. Trades in combat are also a component of control decks. The win condition could be a bomb, or a grind-down-their-life tool like Scholar of Athreos, or just having your creatures outlast theirs until you can punch through winning damage. Basically “aggro” and “control” denote decks which want the game to end sooner vs. end later, and midrange (of course) is somewhere in the middle. Another way I’ve heard it characterized is that if you want the game to go long then you’re the control deck, and if you don’t want it to go long then you’re the aggro deck. Acolyte’s Reward was actually in the deck with the Elite Skirmisher (Pack 2 Pick 5), and I wasn’t thrilled with either pick. I was mainly focused on getting some early game, and I still think the Fellhide Brawler was the right choice there. I totally did not see the Scholar in Pack 3 Pick 6. Yes, I should have taken it instead, especially since I already had several removal options.